Exercise is usually a great compliment to chiropractic treatment. In fact, many chiropractors recommend regular exercise to their patients. It helps with pain management and speeds healing while also giving your mood a healthy, natural boost. Fitness trackers are a popular workout tool that helps people set fitness goals, track their progress, and get healthier. How can they help chiropractic patients, though? What can they offer that will help patients get more out of their treatments? Read below to find out what you need to know about chiropractic and fitness trackers. There are so many fitness trackers on the market with an almost endless list of features. Finding the one that is right for you, or if you could even benefit from a fitness tracker takes a bit of research. Look for features that work for you and the activities you will be pursuing. For instance, if you enjoy water-based fitness activities, you might want a waterproof model. There are also data limits, screen sizes (or no screen at all), heart rate tracking options, and whether you want a clip-on tracker or one that straps onto your wrist. Before making your purchase, take some time to research all of the features that are available to you, then decide what you like and what features would best help you meet your fitness goals. Once you have your fitness tracker you will want to make a plan to ensure that you get the most out of it. Try these tips to make your fitness tracker work best for you. Identify clear-cut goals. When you begin your fitness quest, the first thing you need to do is know where you want to go with it. It is a good idea to record your stats at the beginning and then update them every month or so. This will let you see how many more steps you are taking, how much weight you’ve lost, or whatever else you wish to accomplish. Wear it on your non-dominant wrist. 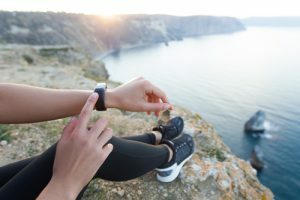 The journal, Medical and Science in Sports and Exercise, published a study that revealed participants who wore fitness trackers on their wrists throughout the day found that they were more accurate when worn on the non-dominant wrist. The theory is that the non-dominant wrist moves less, giving a more accurate reading. The more fit you are the better your chiropractic treatments will typically work. Fitness trackers can help you reach your goals and get the most out of your Overland Park chiropractic care. If you are looking for a gentle (non-twisting) chiropractor in Overland Park and Leawood with more than 10 years of experience in practice — give us a call at 913-681-7757! !